Beige? Who wants beige when you can have gray or greige! 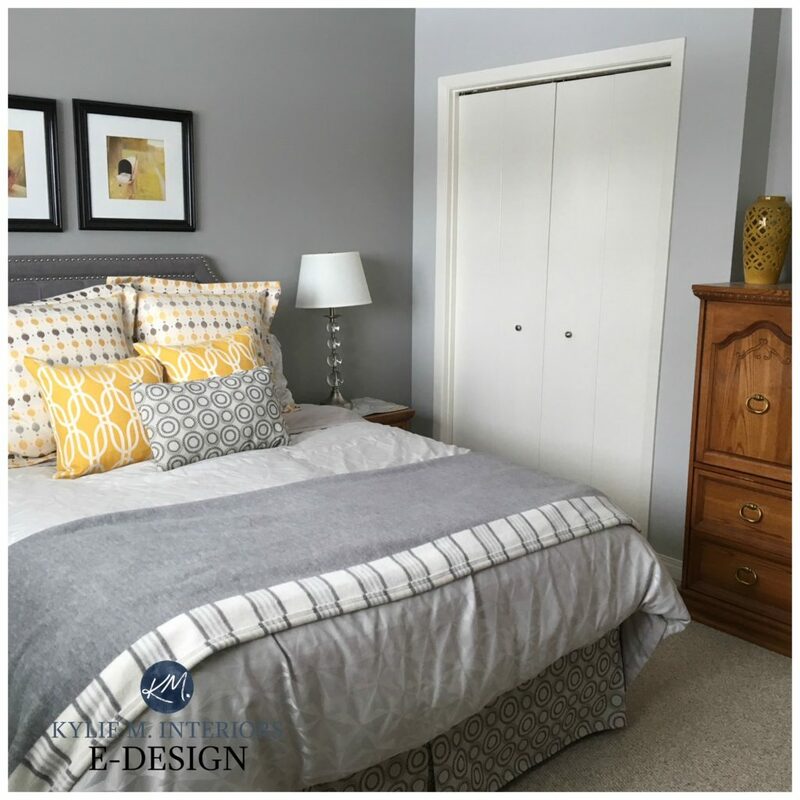 In the Wild World of Paint Colours, gray and greige are undoubtedly the most popular choices for those wanting to update their space – without committing to a full-blown colour. So, I’m here to share with you some of Sherwin Williams BEST Gray and Greige Paint Colours. *To view these colours, click on the underlined names below – thanks! Repose Gray is the perfect paint colour for almost any room whether you’re living in your home or preparing it for sale. Repose Gray is a soft, light gray that has soft and SUPER subtle undertones of brown with a wee dab of purple – not enough brown to qualify it as a greige, it’s just the undertone that adds a certain softness to this lovely colour, keeping it from falling flat. With an LRV of 60, Repose Gray is a light colour, but it’s what I’d call a ‘heavy light’ as it doesn’t have the fresh, bright feeling that you’d expect in a ‘typical’ light paint colour. It will hold itself nicely in a well-lit room, brightening up, but it will also pick up a bit of weight in a darker, shadowed space – which is something to be aware of. Check out my video review of this stunning colour too! Ellie Gray is a beautiful cool gray with stormy blue undertones – meaning it’s not a ‘fresh and clear’ colour, but it has a bit of a cool concrete look to it. It is a soft and calming gray with a nice visual weight to it and a brave choice if you are looking for a gray with a bit more body! With its LRV of 39, Ellie Gray will add depth and personality to a room. And while it is a cool toned gray, the depth of it is what adds a warm and inviting look! First Star is a soft, light gray with cool, but not icy cold undertones that can flex blue or blue-green a bit. First Star has an LRV of 69, so it’s tucked nicely in the light range. Silverplate is a beautiful, slightly cool gray that hits JUST the spot when you’re looking for a gray that isn’t too ‘this’ or too ‘that’. With an LRV of 53, Silverplate might be a bit heavy for a dark room, but looks sharp, clean and inviting in a reasonably well-lit room. 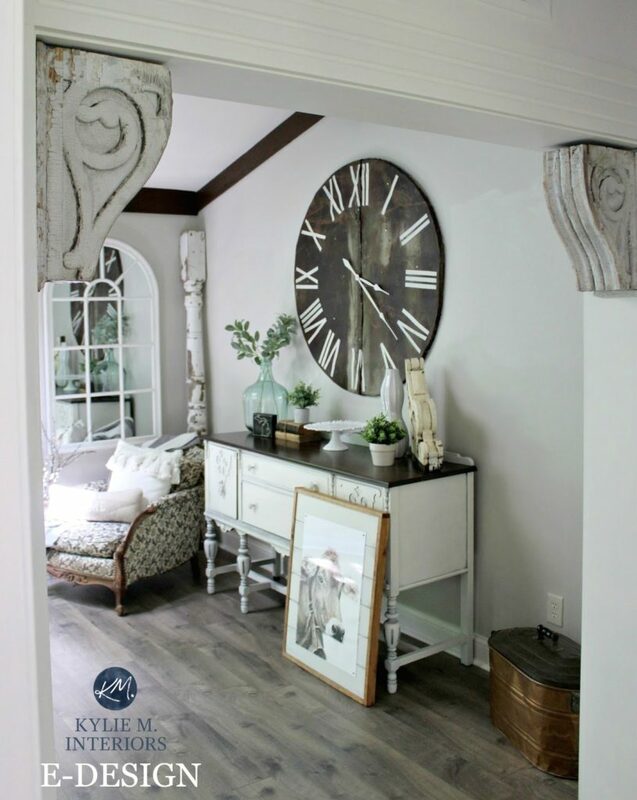 Watch it come to life with clean white trim and wood flooring. Sherwin Williams Big Chill is one of my FAVE slightly cool grays. It has just a wink of a stormy blue undertone, so it’s not an icy/blue type of colour – it’s a bit calmer than that. Compared to the EVER popular Benjamin Moore Gray Owl, you’ll see that Big Chill has far less of the green/blue undertone – making it a bit more ‘neutral’. Pavestone is a beautiful, soft, warm gray/greige. Once a gray has ENOUGH beige in it, it becomes a greige – this one isn’t QUITE there, but it is definitely a warm gray. It can also pick up a very (very) vague soft green undertone, but it’s so passive that it’s virtually unnoticeable. With an LRV of 32, Pavestone might be a bit much for a north facing or dark, shadowed room, but in a well-lit space it a stunning ‘almost’ medium toned neutral with a slightly earth-toned feel. Dorian Gray is one of the more popular grays. While more traditional grays lean to the cool blue or green side, this gray has just a weeee willy wink of warmth in it, making for a softer, more subtle look. While it CAN pick up a touch of green (rarely) as shown in this photo, it generally sits in the purple end of the undertones, but even then it’s fractional. Dorian Gray is a beautiful choice for any reasonably well-lit room. With an LRV of 39, it’s a medium tone, but when paired with white it brightens up nicely. Oh how do I love these colours, let me count the ways….these colours are lovely tones of gray that ALMOST become greige as they do have that subtle brown/taupe undertone, however, the overall look of these colours will be grays that are soft and slightly romantic feeling. Worldly Gray is the lighter version of Amazing Gray. Both colours can pick up a very (very) subtle green undertone, so if you’re sensitive to green (even on the most PASSIVE scale) you may want to read about #10. CLICK on the above to see available packages! While Worldly Gray and Agreeable Gray are very similar to each other, they aren’t quite the same. Both are trying to sneak into the ‘greige’ world as they have far more beige/brown in them than the average gray, however, Agreeable Gray just has a bit more purple (taupe/brown), Worldly Gray has more of a gray/brown undertone (with a weee wink of green). In the above photos, you can really see the range of Agreeable as it flexes a touch warmer in the top photo and more gray/blue in the bottom. Thank you for your comment Lori! The problem is finding ‘good images’ (as I’m sure you’re finding!) It’s difficult to find photos of updated spaces with fresh wall colours where they keep the wood trim. I will get looking though as you make a very good point – thank you! I’d like to see photos with dark wood trim as well. That’s the reason I’m on this site. I was hoping to find help in choosing the right paint color for my 1926 home. I’m having that problem as well. I have lovely stained wood trim and doors and cabinets that I refuse to paint white. All this gray will go away soon. When I moved in my house (30 years ago!) the walls were painted gray. A color called sterling. The carpet was a shade of gray as well. It all changes and then changes back. Just go with h what YOU like. Hello. I painted all walls in my lower level Sherwin Williams Gauntlet Gray. Can you suggest a white to go with for the moulding, casing and base trim? Floor is a medium to dark wood. Thank you!! Hi Scott, thanks for asking! I’ve found that White Dove OC 17 is a nice compliment because it doesn’t have as much yellow as many of the other whites/off-whites. Other than that, I’m a big fan of ‘regular old white’ which Benjamin Moore can’t do (you have to tint their paints) but other brands can. Hope that helps Scott! Great stuff. I have repose gray as our main living area, after getting tons of samples. Have no regrets whatsoever and still in love with the color! Loved your post, so many excellent tips! I am painting a living room which has high ceilings, poor natural lighting and oak trim around the windows and doors. Is there a gray shade you suggest given these factors? Do you have a recommendation or 2 for grays that go with dark wood trim and baseboards (modern straight edges and corners in a deep cherry wood color)? I’m having difficulty finding the right color for our living room and den. Thanks! Thank you, thank you, thank you!! From the lady with 9 different stripes of gray on each wall. This helped me a lot! Off to Sherwin Williams I go for a sample of Amazing Gray. AWESOME! These are the comments that I love to get! I’m so glad I was able to help and if it turns out – send me some photos girl! LOVE this! I love how you described the grays so perfectly. This is so incredibly helpful. Thank you! We are building a new home and plan on painting it agreeable gray. Would a soft gray tile be a good combination or should we stick with a tan tile? I have a sample of what we’re going for, but I can’t add the picture. Hi Carranda, you might want a tile that is the same blend of neutrals that Agreeable is. Too gray might end up looking blueish or cold compared to Agreeable, too tan might end up looking dirty. A tile that is a soft gray with a ‘greige’ feel to it would be best. Hi Amber! Revere Pewter can flash a bit green and muddy, Anew is quite greige feeling with a taupe-ish base and Amazing is a greige with less taupe in it. Check out SW Collonade Gray as I think it combines all of these into 1 epic colour. Thanks Kylie!! We went with Collonade Gray and I absolutely love it!!! Thank you for the suggestion! You are most welcome Amber, I’m so glad it worked out for you – yahoo!! Hi Pat, thank you for your note, I do try to give as much free info as I can on my blog and if that doesn’t work, then it might be time for some E-design – it’s affordable and fun! Thank you for the post Kylie! I am one of those folks who obsesses over wall color and can take many months before I finally make a decision! 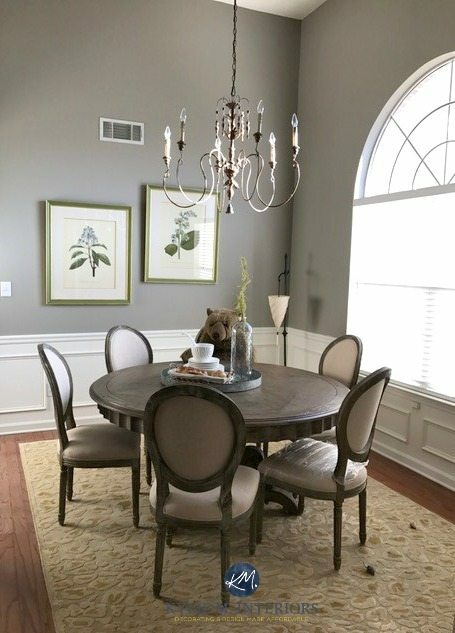 I chose Repose Grey for my family and dining room. For my bedrooms I would like a shade darker (true grey and little to no beige undertone). I was considering Amazing Grey. What would you advise? I appreciate your help! Hi Enedra! So if you are looking for a colour that is a shade darker than look no further than Mindful Gray. It has the exact same undertones as Repose. That being said they are gray with a soft taupeish undertone which makes them slightly softer feeling than a lot of the cool grays out there. You can also look at Benjamin Moore Chelsea Gray which is ‘QUITE’ a bit darker, but very striking! I used it in our last home in our bedroom and loooooved it. Hope that helps! Thanks so very much for this information! I have been obsessed with gray for MANY years (ashley gray, chelsea gray, stone are all Benjamin Moore favorites!) and now find we are in need of staging our home. We prefer to stay in the “greige” family and are just trying to lighten and neutralize the walls a bit. Your tips were super helpful! I’m off to the Sherwin Williams store…..! You also may consider “Modern Gray”. A very SLIGHT (and I mean SLIGHT) hint of a pink tinge or hue, but color is FAB! I used it as trim on my house with Fawn Brindle and Black Fox on the front door. It’s a beautiful combo. Thanks Kelley, I DO love Modern Gray and if I were to do my top 12, it would be right there! And you’re right, it does pick up a barely there pinkish hue, without being ‘pink’, so it’s a lovely soft colour. And good job on the colour palette, that would be LOVELY! Yikes! Now I’m panicking about having chosen Modern Gray for my interior. I don’t want any pink! Would Mindful Gray be better? Snowbound is the trim color. Suggestions for wall color with SW Alabaster trim? I just remodeled my kitchen with Alabaster painted cabinets (formerly oak), white beveled subway tile, and dark gray/black granite, but I’m struggling with commiting to a wall color since the house has an open layout so the color would be in the dining and living rooms as well. I’ve considered Balanced Beige, but it almost looks dirty next to the cabinets and backsplash. Dorian Gray is pretty, but I’m worried it would be too much for the open layout. I absolutely love reading all your articles! I really hope you can help me! I’m having a hard time choosing a color for my bedroom. I have poor natural light and my room is small. I have expresso color furniture. I currently have revere pewter in my livingroom which I love! However, my bedroom is next to my livingroom and I would like something to compliment the paint in my livingroom. I was looking into the Greige colors and I was thinking on painting my bedroom mindful gray or just stick with revere pewter. I want a color that compliments all my different color bedding. My floor medium light wood. I would love your advice and suggestions. Thank you. Im completely torn and have purchased at least 10 sample paints that i love until i put them on my walls. Im replacing all my browns and taupes to black, grays & whites. I have just bit the bullet and painted out my oak staircase white my oak.kitchen is next to be white. Now Im looking for the Perfect Gray for my foyer and my upper hallway to compliment to black interior doors and the peppercorn kitchen. The lightening in my home isnt excepting of the Greiges (turns them peachy or brown). I would like a true grey, im fine with a blue undertone opposed to green, brown or purple. Ive sampled Collonade SW, Coventry Gray BM, Passive SW, Woodsmoke SW, Driftwood Grey MS, Revere Pewter BM. To name a few. None have the umph Im looking for, I want the doors to pop and the look to be classic, sleek, modern. Hi Melissa, I refer most questions like yours to my Online Consulting where I can look at photos, but to give you something to go on remember that youre Peppercorn has a blueish/purple undertone so you’ll want to keep those tones in mind with your new colour. I’ve recently worked with Big Chill by Sherwin Williams and it had both of these subtle undertones as it’s a gray with cool undertones. Stonington Gray is also a bit winner with its slightly blue undertone. Definitely stay away from Revere Pewter and Collonade. You’ll find Big Chill is a wee bit more ‘gray’ than Passive, while still having similar undertones. I have half of my open living/kitchen area painted SW Amazing Gray, but am uncertain if it is a good fit. You mentioned above that this paint color has a brown/taupe underdone. Throughout the day I see more of a blue undertone to it, and at night it will look slightly more gray. I have honey oak trim and cabinets and am wondering if this can cause more of a blue tone to come out. I have been doing research, but cannot come up with a clear answer. I was hoping for more of a neutral gray that will go well with honey oak wood work, brown counter tops and black appliances. I am tempted to bite the bullet and paint my remaining walls to see if the coloring improves once all of my current beige walls are covered and I no longer have another color to compare to, but prefer not to spend another $100 on paint that could potential be a poor choice. Would you be able to offer suggestions on a gray that goes well with honey oak and do you have any feedback on why I am seeing a blue undertone with the Amazing Gray? Thank you! Hi Becky, yes undertones can be tricky….Now rest easy with the knowledge that Amazing Gray does not have any blue in it. I’m thinking this might be your exposure (Northern exposure can sometimes cast a soft blue light). I’m wondering if you need to warm the colour up a bit, which should be a wise choice given the other products in your space. Sherwin Williams Urban Putty is a pretty colour (although not gray…but it is neutral). I painted my daughter’s room agreeable grey and used gold accents and coral. Wanting to paint living room and cannot decide between Anew grey or repose grey? What is the difference? Hi, I’m so glad you love these gray colours too! Now of course Eider White is the lighter version of these colours, but it usually isn’t quite light enough for trims. One idea is to have Eider White reduced by 25-50% (lightened) so that it’s the ‘same colour’ only lighter. Another off-white that I like is actually Benjamin Moore White Dove (which SW should be able to colour match quite well). A slightly warmer, but not too yellow option is SW Creamy (but keep in mind it is warmer than the above 2 options). I hope that helps, thanks for visiting my lil’ blog! Where do you find your art?!? I love the horse picture and the huge bicycle picture you have on another post that covers a book case. Well I get a lot of it at Home Sense, but that bicycle was from Urban Barn and the horse was from this random store in Nanaimo called ‘The Quilted Duck’. Artwork IS so personal and it’s only the odd piece that really strikes me and then HOPEFULLY it also matches our home! Hi Kylie! What are your thoughts on Sherwins Williams Passive gray? I have their Carbon in my husband’s office and love it. We just bought a new house (with loads of different woods throughout) and I am considering either Passive (which seems very close to the Carbon colour I loved) or Repose Gray as the main colour. I am worried that the Passive will be too cold though as I live in northern Canada but I really dislike beige walls (Revere Pewter just looks beige to me. I really dislike it as a colour). Thoughts? Hi Sarah, thank you for your question! While I’m happy to answer quick and generic questions, when it comes to questions readers have pertaining to their home, I do refer to my Online Consulting. This is only because I receive dozens of questions from my readers everyday and just can’t answer them all AND keep up my business! Thank you for your understanding and thanks for visiting my site! Just painted my living room Sherwin Williams Useful Gray. Didn’t think I would ever find the perfect color for my “vision” for this room, but this is it. I just keep walking around the room staring at the walls with a big goofy smile on my face 😀 It really comes across on my walls as more beige than gray, but what a lovely neutral backdrop for the aqua and white beach cottage theme I’ll be introducing into the room. I love all your very helpful posts. What grays would you recommend for a n open floor plan that gets primarily eastern light? The flooring will be a medium gray oak. Good Morning! We are building a new home and are wanting to paint it gray. We originally thought of doing Gaunlet Gray but the neighbors house is that color so we were thinking instead of doing a darker gray go lighter. The house is all shake siding, white windows, large stained wood with glass front doors, stained garage doors, and stone in two different places on the front of the house( the stone color would compliment a gray because it has grays, tans, and greige colors in it). The two colors I’m considering are Mindful Gray or Repose Gray. Do you have an suggestions or pictures of of homes with those colors on the exterior? Your site has been so helpful! I have been wracking my brain for months trying to select an overall color for our new home. Thanks to you, I have finally chosen Agreeable Gray. Now I need to select a white for the ceilings. Can you please suggest some nice whites that will work with the Agreeable Gray walls? I would GREATLY appreciate it! Trying to find the perfect shade of gray for my bathroom. It gets a lot of nateral light and I don’t want the paint to appear washed out but I do not want it to look dark either. I have been lookin at your 10 favorite SW gray colors. Very pretty! Which warm, soft gray would you suggest that I try? Thank you so much for your thorough reviews of these gray colors! It is so helpful. I noticed the discussions on these centered around using these colors on the walls. Any thoughts on using them for cabinets? We will be painting our upper kitchen cabinets in SW Antique White and would like to paint the bases gray. Any suggestion on SW gray colors to focus on? Thank you for all your articles. They truly help and your description of light was awesome! So in this article you talk about greys being more muddy, do you have a list of more clear colored greys? Like your video on agreeable gray. You talk about a clean white for trim. Which white is it? Good question Paul, it’s actually just ‘Benjamin Moore White’ – as white as it gets! Thank you for this video and wonderful description! I read through all the comments to see if someone else asked the question “What white did you refer to as the clean white?” and here it is!!! Also, wonderful to know that 2 years later it is still a wonderful neutral gray! Good article – very helpful. We are building and have Kitchen cabinets and Great Room built ins in Amazing Gray and a Kitchen Island in Urbane Bronze. We are planning to use Worldly Gray as our main wall color (Great Room, halls, etc.) Will this provide enough contrast so that the Great Room built ins are not “lost”. Thank you so much for this post. I previously failed miserably with gray for my house. We recently bought a new home and I read and studied your posts regarding grays. I was terrified of making another gray mistake. With much stress and prayer lol I chose worldly gray for all main living areas, amazing gray for my sons room and my daughter chose repose gray for her room. I’m in love. It looks beautiful. Your understanding of color is amazing. Thank you!!!! Love your helpful website! Looking to paint a bedroom with white trim and light gray walls. I have blush/pink faux silk curtains and a pretty soft blush quilt with white linens underneath. I was wondering if you might suggest a gray that would be a pretty compliment to the pink. I love wearing gray with pink and thought it would be lovely in a bedroom. Thanks so much ! Thank you for the great information on the different grays! Which gray would you recommend with Sherwin Williams Navajo White trim? I’m remodeling my kitchen and getting very worried that my choices may not be as cohesive as I think they are. What design selection should I select to get your input on my choices as well as recommendations for wall color and counter tiles and hardware. We just had our formerly gold-walled living room painted Agreeable Gray. It’s a very large room with 20′ ceilings. I’ve been living with the color as we add new pieces of furniture, new rug, new accents, but no matter how hard l try to like it, it just feels very cold to me. I see no brown at all in it. Help! I need a warmer gray (and for my spouse to not scream at me since we just spent alot having it painted). Thanks! Hi Beth, normally I refer personal questions to my e-design as I get SO many in a day! A quick colour for you to check out would be SW Accessible Beige, which is the cousin to Agreeable. Agreeable is more like a gray with a GOOD beige undertone. Accessible Beige is a BEIGE with a gray undertone – sometimes darkening by 25% can also add a bit of depth for those tall walls, helping them feel a bit warmer! We are currently building a new home and starting to feel the stress of picking colours! As our exterior colour we are thinking Gauntlet – is there a white trim you would suggest to along with? Also, planning to do a fun front door in a shade of green? As for the interior I am a white person but still want the cozy feeling. Do you suggest painting the ceiling, trim, doors & kitchen cabinets all the same and which is the best white for that? Hi Emily, thank you for the note! Unfortunately do to the HUGE amount of questions and e-design consults I receive in a day, I am unable to answer personal questions. I try to give as much good info for free and if that doesn’t work – then e-design is the next step! If you would be interested, here’s the link if you are interested ???? 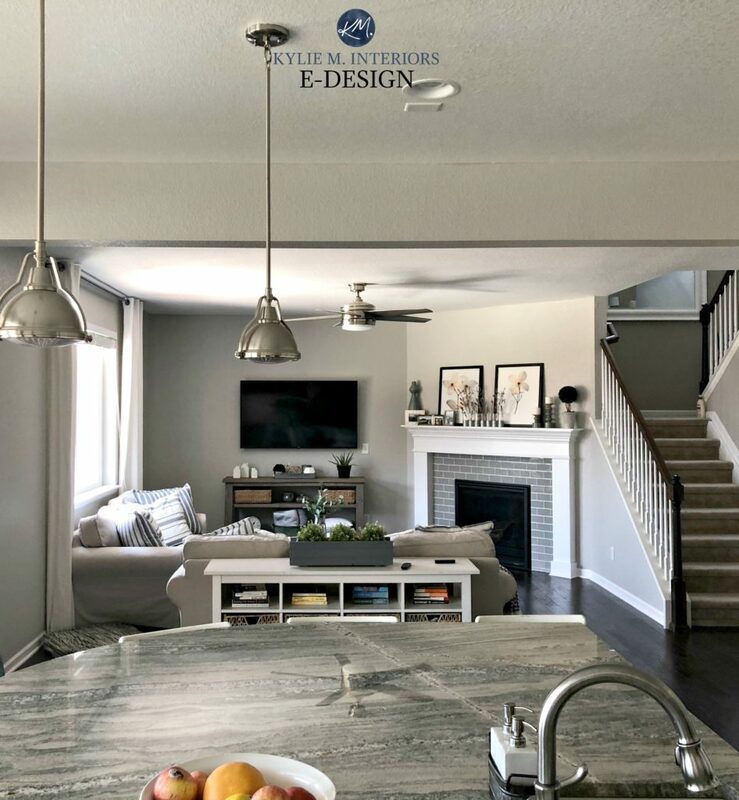 https://www.kylieminteriors.ca/online-decorating-design-services/. This way I can look at your house plans and do things the right way! Hi Kylie! I just LOVE your blog and videos…so incredibly helpful! You are amazing! I have decided on Agreeable Gray for my first floor made up of small rooms. I want something neutral and light because of the size of the rooms however I fear that it might be too light. Anew Gray I think would be too dark. What would be a good amount to darken Agreeable for more depth but still keeping things bright? Your articles are very informative! We are building a farmhouse and deciding on paint colors. I believe I will like warm white walls in the open areas and a warm gray in the bedrooms. Do you think SW- Dover White and SW- Repose Gray will work well together along with SW-Alabaster trim? thank you Kylie for sharing a wealth of information! Well thank you Millie, what a lovely note to get and I can’t WAAAAIIIT to see the photos! We are building a log home. With so much wood I wanted my kitchen to make a statement. I was leaning towards grey cabinets and wanted my hood to be a focal point. What color gray would you think would look best in a log home? I have looked at so many pictures, that its overwhelming. From the research I have done I love Gray Owl and Worldly Gray! My house right now is SW Functional Gray and I feel as though it is a bit to “heavy” for my bedroom! I have two 7ft. windows in my room and it’s on the back part of my house facing south and the windows are South West. I would like something “light, clean and fresh” would recommend Gray Owl? Hi Kendra, those are both fabulous colours! I think for that fresh lift that you’re looking for Gray Owl is probably a better choice. Worldly gray would still be better than Functional for sure, but Gray Owl has those cool undertones that really add the fresh vibe! What’s your opinion on SW Light French Gray? Appears close to SW Repose, but worried it might look too dark in common areas. Thank you! HOpe that helps and stay tuned for the video! Hi Michelle, WEEEELLLLL, a nice crisp gray generally does have blue in it…I would think your BEST bet for a crisp gray that is as neutral as possible would be SW Big Chill. Depending on your exposure and interior bulbs it might hit the spot but it can pull a weee wink blue – nature of the beast! Kylie thank you so much for this article! It helped us tremendously! We tested so many greiges in our small north facing family room (with patio doors), and finally decided on Agreeable Gray! We love it! It definitely reads a touch green at times but we felt that was preferable to the mauve undertones of Collingwood or beige of Edgecomb. Cheers! I have really been enjoying your blog and I love gray paint and am excited to paint my living room/dining room gray. I typically prefer the cooler grays but I have a bluish/gray couch from the Shelter collection, West Elm. I am thinking something along the lines of Agreeable Gray would look a little better on the walls than a cool gray. Is there anyway you would be able to steer me in the right direction? Thank you!! Hi Ashley, yes that might work for you! I’ve had Agreeable Gray lean ‘considerably’ more gray many times, even though it’s a greige type of colour, so it could hit the spot! Hello and thanks for your blog. I have a lot of beige in my tile and accessories but am wanting a more modern grayish paint. Right now I am using Nantucket Gray in my kitchen and living rooms and Manchester Tan in the rest of the house. So I am looking for a greige I guess that looks great with gray or beige and brown things…. And wondering what you think of Versitile Gray from SW? Hi Rebecca, you might find Versatile gray a touch too purple toned. Maybe check out Dorian Gray??? I really enjoyed reading your blog, lots of wonderful information on gray paint. Hi Lisa! Well Light French Gray and a 50% reduced Worldly Gray would just be SO different from each other. From the sounds of it, I think that something like Agreeable Gray lightened could work. It’s REALLY similar to Worldly Gray, but Worldly can pick up a weeee wink of green and is a bare touch warmer. Have you looked at SW Conservative gray, I like green hue in it. Will it be washed out in a room with North/East and South window? In my area, the Parade of Homes color of choice seem to be SW Knitting Needles. I fell in love but in my house it pulls lavender. My 2 story great room does happen to be North facing, however, I’m sure some part of those homes are northern facing and I didn’t see any lavender at all. Have you tried this color in any of your homes? Do you have an opinion on undertones for this color? It seems that when I was painting amazing gray in my half bath it also looked lavender until I was done so… I will be happy to do a paid consult, but wondering about your take on this color in general. Thank you!!! Hi Tracy! Not surprising, Knitting Needles can TOTALLY do that, I would think even more so in the northern facing spaces. Sometimes it’s relative to what it’s with as well, for example of your trim is a warm white, not a clean white or if you have warm toned woods, this could encourage it along. I find that in north facing spaces it can be HARD to get grays to NOT pick up a touch of purple and some people are more sensitive to it than others. Now Amazing Gray could…a bit…but if anything it’s a greige with a very vague green undertone, so I’m glad you stuck it out! However, with Knitting Needles it IS lavender than you’re seeing. For a subtle shift, check out SW Silverplate which is absolutely stunning. Still a cool gray, but it should save you from the purple! This was sooo helpful. 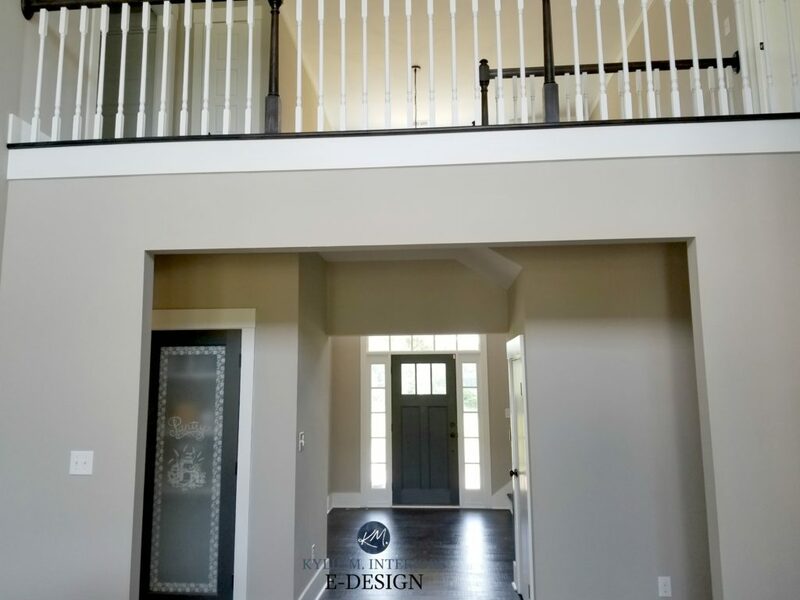 We currently have inset accent walls painted in Mega Greige and looking for a lighter greige (lighter than Perfect Greige) for the whole great room area. While we like gray, our furniture is light beige and kitchen is in the beige family as well and afraid something too gray will not match. My husband doesn’t like colors that read too green or purple (room does not have a lot of light). What are your thoughts on Collanade, Useful, Agreeable and City Loft? Thanks! I am in love with the grays, and I am getting more insight from your site than anywhere! Thank you! Hi! Just discovered your work, love your insight! Can you advise, my house is painted one color, not sure the color, a builder’s tan with all almond color trim and doors etc. (Yuk, I prefer white) but oh well. So the floors and cabinets are a warm maple, except for some ivory carpet in the great room. I’m thinking of repainting, not sure what to use, and our living space is mostly North facing, not a lot of natural light except I the sun room. Was thinking of going for an accent wall around the fireplace because that small wall is super shadowed with two Windows, on either side of fireplace. I love the light tan /beige colors, but am open to a greige accent wall. Which looks better with Comfort Gray–Accessible Beige or Agreeable Gray? I’m also thinking of adding in some navy blue in the room, and I think AB would look better with that. Thoughts? Hi Emily, both would be okay, but I might lighten both by 25% to shift the contrast a bit. And they would BOTH be great with navy, I’ve seen AG go considerably gray in some rooms, meaning it’s a natural partner to navy (north facing rooms particularly). Hi, Is Agreeable Gray a warm gray? If so , does that mean On the Rocks is cool? I want to try a warm so I can avoid painting my medium brown stained trim since we have crown molding, chair rails, built-ins etc….thank you for helping me u understand warm vs. cool!! Finally, someone who understands color. Do you ever think about the age of the house and the colors used in it. My house is Old! and some of the beige/tan colors just seem to strike me as an old color in an old house. Have you even considered doing a blog on that? Just wanted to let you know I settled on collingdale for the walls and am hoping the painter can tint his preferred trim paint white dove. Thinking to do our built ins dark gray or black. Would love your opinion. Our Home has Sherwin Williams Agreeable Gray throughout. Most of our Living room, Dining Room, Office, and bedroom Furniture is a darker walnut and chestnut wood colors. Do you think this will be too much of a contrast and make areas seem chopped up to the eye? Trying to find a nice contrasting dark gray tone to paint our Kitchen Island and Range hood. Our walls are agreeable gray/ southern exposure and the upper cabinets are painted in Pure White. We live In Seattle Wa , were it’s gray almost everyday. We must be crazy to pick gray? Hi Sandra, when it comes to personal questions I have to be careful, as I haven’t see your flooring, countertop or anything, so it’s just guessing at that point! If you’d like me to take a look at those things, I do have an affordable E-design service which is fun too! https://www.kylieminteriors.ca/online-decorating-design-services/ And no, you’re not crazy! The right gray can be a soft backdrop and a dark one can add a nice contrast to white cabinets! Have decided upon SW Perfect Greige for large great room. I have a wall I’d like to paint a much darker gray as an accent wall. What do you think of SW Peppercorn with Perfect Greige? I saw you mention it has purple/blue tones to it, which makes it sound like it wouldn’t go with Perfect Greige at all. 🙁 Any other suggestion for a darker gray to go with Perfect Greige? Thanks so much! All of the trim in our house is SW Maison Blanche. What a greige color would you suggest with that trim color? We just want to repaint the walls in our house not all the trim. We also have wood floors. Hi Kyle, It’s so difficult to pick paint out with so many to pick from. I boiled down to SW Dorian gray and Mega gray for my living room. I live in a small rowhome and only have one window. I have a chocolate couch and one wall is brick with like a cement color. I don’t wanna go real light like repose, I want some color. Can you tell me the difference with ghise teo and any suggestions? Hi Diana! Well, you will find that Mega Greige is a bit warmer, whereas Dorian Gray has a bit more gray in it. That being said, I prefer Dorian Gray for your purpose (without seeing the home, based on what you’ve written), simply because it has that touch grayer in it, which might feel a stitch fresher than the more greige Dorian. I wonder if you might entertain Anew Gray or Mindful Gray??? They are just a bit lighter, but will still offer some contrast with white trim! I am loosing my mind trying to decide on the paint color for my son’s nursery. I LOVE “greige” colors. But I can’t stand the green undertones of some of them. Revere Pewter is one of my favorites but I keep seen the green coming through and I am afraid the navy would intensify that?. I have ” Repose Gray” in all the common areas of my house. The theme for a nursery is Nautical (Navy & white stripe curtains) and these particular room has light coming from east and north side. Do you have any recommendations to keep the room on the desired pallet (navy, greige, mint) PLEASE? I wanted to take a minute to THANK YOU for your “guess”. It is more valuable than you think when I get that overwhelmed! 🙂 Edgecome Gray was always on my list and I decided to give it a try! Once I put it next to the fabric I was using for the curtains, I knew it was the right choice for this project. Let see how it goes. And I will definitely consider your services for my future projects! Thank you again for your time, your posts and your advice. Well Brenda, thank you so much! I get so many questions that it’s SO nice to get a compliment like yours – THANK YOU THANK YOU! Love, Love, Love your stuff! Oh Goodness, could we use your help , Kylie. Currently have NINE SW paint swatches down.. (painted on cards- just like you suggest) and we are stuck! We even have a custom blend between Agreeable Gray and Accesible Beige! (Worldly Gray?? lol) Looking for a warm gray with a higher LRV. Would even go with a greige or not so tan-tan… (wool Skein is one of our swatches)… suggestions?? High ceilings, crown molding, new house. Feeling lost! Thanks so much. What would be a Sherwin Williams color that is comparable to BM Chelsea Gray? My painter uses SW paints. I’m thinking about using SW Colonnade gray on my kitchen cabinets and would like my island to be darker and like the look of BM Chelsea Gray. Love your blog. You have a wealth of information on it. I finally understand LV. Thank you much!!! Thanks Tracy! Your best bet might be SW Classic French Gray, although it doesn’t have QUITE the same softness. I also like SW Dovetail! I love the Benjamin Moore Wickham Gray colour, and I am trying to find a SW one that is very similar. Would you be able to let me know a couple of options? Kylie, I have searched your site for an answer to this generic question. I need a gray like Agreeable Gray but with a LRV of at least 60. AG is too dark for my space. HI Julie, have you thought about lightening AG by 25%. The undertones can shift slightly, but it would be the same idea as choosing a new colour in that LRV range! Thank you for writing this as I did a search on best gray’s from SW and your blog popped up. This is after buying 7 colors trials and getting very frustrated! We went with Collonade Gray, and LOVE LOVE LOVE IT for our great room. It’s exactly how I pictured in my mind, but couldn’t make the connection to the paint color without purple and blah showing up! So, thank you! I’m going to send you some pix of the shelving units we have to pick a color to go with the Collonade. Thanks so much for your help! Laura, I love to hear this – thank you! I actually just painted OUR great room in Collonade too and seriously – SO stunning – I’m pretty much obsessed with it. I will be doing a blog post about it at SOME point along with all of the feature colours I paired with it. Thank you for the note! In my livingroom we have a tan couch , the room is north and south facing. Our kitchen is north without a lot of natural light . I’m trying to decide between accessible beige and colonnade. Not sure if I should put collonade in the livingroom with the tan couch or the accessible beige. I would use the other color in the kitchen . Oh the world of picking a grey is a tough one ! I am ordering a wallpaper that’s a charcoal grey with metallic copper geometric shapes in it online and am having trouble picking a lighter grey for the walls . Any suggestions on which one of these would go best with charcoal? Thank you ! Hi Shelby, you’ll want to figure out what TYPE of gray is in the wallpaper – gray will have 3 undertones, blue, purple or green, so your charcoal should lean slightly into one of those. You would then pick a light colour with the same undertone. I could throw a bunch of ideas out, but they could be TOTALLY WRONG with your wallpaper if the undertones are different! First off, I just gotta say I think you are pure genius. I love that there is someone else who is as OCD about color as I am. (Just joking.) I’ve been scouring your site for info on the ‘new neutrals’ and color theory … so incredibly helpful, thank you so much for sharing your knowledge. I have a general question… what darker colors do you feel would complement Revere Pewter (or similar… Collingwood or Edgecomb) for a south-facing living room accent wall? I’m focused on Chelsea Gray but would like options in the navy to warm gray ranges. Thanks, and please keep on being awesome! Love your blog/videos and expertise! I’m building a small ranch, (1350 sq ft) South East facing and only get one color choice. I’d like a warm neutral with blue//green undertones. I like SW comfort gray, SW knitting needles and SW gossamer veil. I love your site, and I used to live in your neck of the woods in Port Moody. I am tired of my beige walls, but scared of white. I like gray but can’t afford new flooring. Can you do gray walls with light beige carpet? I’m having a hard time deciding which gray to paint my office it’s 9ft X 12ft with navy carpet, I’ve narrowed it down to Sherwin Williams Dorian Gray or Repose Gray, what are your thoughts?? Hi Teri, it all depends on your natural lighting and how much you have! Repose would be a softer, lighter look, Dorian can be a more moody look, but I’ll warn you that i HAVE seen Repose Gray pick up a vague green, which wouldn’t be as nice with your navy carpet (doesn’t mean it will, but it can). And even though Dorian Gray is a darker version, it doesn’t tend to do that. Hope that helps! Thank you for responding, I have one window but the natural light is minimal. I have part of my kitchen painted in Dorian gray, which I love. But I’m stuck with the blue carpet and I don’t want and chance of it looking green so Dorian Gray it is! I would love to get your take on Sherwin William’s Basalt Powder and Gracious Greige. They’re new HGTV colors, and there aren’t very many reviews out there. Do you have a video on modern gray by Sherwin Williams? Need help picking interior color for whole house. I’m debating between Sherman Williams Wordly Gray & Agreeable Gray Which do you think? Also what color for trim, doors…white, off white? I”m confused – the chart shows analytical gray in the 10 but then there is no description for it. I am strongly considering going with that one and found this page on a search about it. Did it get dropped off your top 10? Hi Kimberly, it did! To give you some tips though, Analytical Gray is a light-medium greige that has a soft green undertone to it that is more noticeable than what you’d find in Amazing Gray. It has a lovely muddy look that would be that bit warmer in a southern room but a bit more greige looking in north. I hope that helps! I love your wealth of information on your website, and I find the information about LRV especially helpful. Thank you. In your opinion what is the difference between BM Edgecomb Gray and SW Agreeable gray. Both are warm grays, but I think that BM Edgecomb is a bit more greige. Would one work better in a combo light room (meaning an open room with a lot of light in one area and the other space a little darker? I noticed that BM Edgecomb can read more beige in less light. How does Agreeable gray stand up to that? Does having the one wall a different color make sense? Thanks and when ready I will consult with you on a perfect color! Would Sherwin Williams Agreeable Gray coordinate with an accent wall in SW Fireweed in the living room? Hi Kylie! I enjoy reading your posts and watching your videos! I have been researching color.. and read that you should not use Mindful Gray and Dorian Gray in the same room that they will not go together .. I would like to know your opinion on this and why not? I was thinking of transitioning these colors from one wall to the next.